Another WIP bites the dust! This one is the Round One sampler from Modify Tradition. I finished the top near the end of last year and it sat neglected until now. I generally don't like samplers, and I'm still not crazy about this one. I do find, however, that once it's been quilted, bound and washed, even a ho-hum project gains a mysterious aura that makes it attractive. I had originally intended this quilt to go to the lab so that Lindsay could stretch out on the sofa and rest her weary head in comfort, to facilitate the thinking of brilliant thoughts. But a secretary in our department has been quite ill and is starting a long recovery process at home. 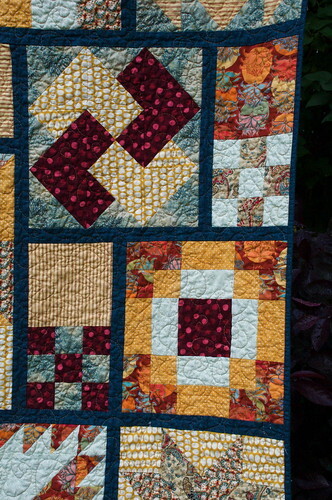 I thought a cheery quilt like this might be nice for her. So I'll have to make another one for the lab. I realized that the last three quilts I have completed have gone out to others, and in the meantime, I don't have a quilt that's big enough to cover my bed properly. The next quilt I finish is staying home! When I was editing my WIP list on the sidebar, I started thinking about the difference between WIPs (works in progress) and UFOs (unfinished objects). I first heard them differentiated by Jennifer. I had always lumped them together in my mind, but classifying them separately does make better sense. A UFO is at a stage where it is sitting around and just needs a little push to be complete. Perhaps it's a quilt top, or a quilted piece that needs binding, but it's languishing in a limbo of neglect. A WIP is a project that is being worked on, perhaps blocks are still being constructed, it's on the design wall, but it the quilter is actively engaged with it. By classifying WIPs and UFOs together, I added to my sense of guilt whenever I started a new project before finishing the old one. I don't think anything is sadder than the prospect of having stacks of uncompleted quilt tops in the closet. But this way I only have one UFO - the gorgeous Paprika. I have several WIPs, and I am making progress on all of them, bit by bit. I like having several projects on the go at once, because they are all at different stages. Some require careful piecing and thinking at each stage, others can run through the machine chain piecing like a house a-fire. I can always find a quilt that needs exactly what I feel like doing at any given moment. I'm not sure if this is reasonable, or merely a way for me to justify starting new projects! What about you? Do you feel differently about WIPs and UFOs? Do you worry about justifying new projects when others are still in the works? 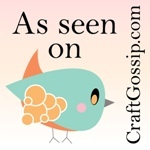 Updated to add to this week's Sew and Tell over at Amy's! Lesly, I love this sampler!!! That colorful sashing really makes the blocks sing. Your friend will love it. I lump my WIPs and UFOs together, but am going to rethink that ;-) You've made some good points. Take care. Wow what striking colors! I love it! I love how you laid out the blocks. Usually I'm a little ho-hum about samplers, but this setting is stunning. I also agree with you about the difference between UFO's and WIP's, they're definitely different and I like your idea to separate them more concretely. I agree, why is it that the binding finished often makes one fall back in love with a quilt??? Perhaps that is when the drudgery ends and the quilt starts to return all the love that has been stitched into it? 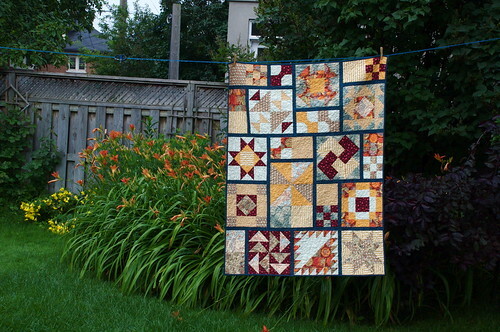 This sampler quilt is a delight! Hmmmm good question. I lump my WIPs and UFOs together but that could be because I don't (usually) feel guilt about starting new projects when one is on the go. Having said that, sometimes I have to tell myself I can't start something new until I work on something older. I am in love with your sampler. The setting is completely inspired and I am totally going to steal your idea. First of all, your sampler is gorgeous, and why oh why oh why is Paprika still a UFO? If I had that in my closet so close to completion, I'd be busting a move to get it finished and on my bed!! IMHO, the difference between a WIP and a UFO is that you have to bribe yourself to work on a UFO - for example, you can go buy new fabric or work on new that new project you really want to do when you've done some work on that UFO! The crown molding in my kitchen is currently my biggest UFO....... I really want to redo my guest room, but I keep telling myself that I have to finish the kitchen before I get to work on the guest room! I keep saying I'm not a sampler fan but this once again has me wanting to do another. I think I don't like traditional samplers. I really do like the colours, the setting, the blocks, the quilting in this great sampler. Maybe it is the challenge to think out of the box. And now I need to think about WIPS and UFO's. hmmmm? What I like about this sampler is the setting (not 12 - 12" blocks in tidy rows) and the sashing. The colour and the relative thinness of the sashing are great. To me, UFOs are the things that I've retired before finishing; the stuff I no longer want to invest time in but can't bear to give away, even if the whole quilt top is done. WIPs, on the other hand, are quilts that are on my to-do list, regardless of whether I stopped working on them last week or 6 years ago. 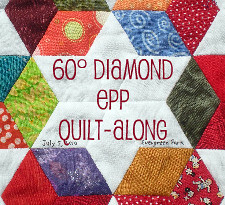 Great quilt, and a perfect way to show your care for a friend in need. I also have several projects going at once. There are a few things in the nearly finished stage - one on the frame being quilted, some all ready to quilt in their turn; a few zip-locks of just blocks, sketches and promises; one project on the design board; and more dreams and beauties nearly ready to emerge from the stacks of fabric. I like to have something fast and easy, something more complicated, and even hand sewing available as you said, for whatever strikes my mood and time frame. Thanks for sharing your pretty sampler. Have a good week! I lump them all together, but refuse to feel any guilt whatsoever!!! I like being able to work on what is calling me at the moment!! I really like how the blocks are all different sizes! 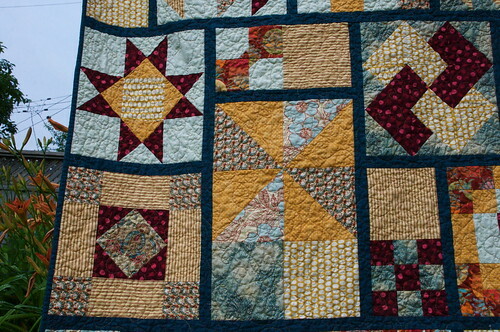 Lesly, I really like this quilt - the colors are great and original. I'm glad you pushed to finish it. Good point about UFO's vs WIPs. feel the same about samplers, but yours looks wonderful. as for WIP's and UFo's...they are all NOT finished just with different names and i wish i didn't have any! haha but what kind of a quilter would I be then. 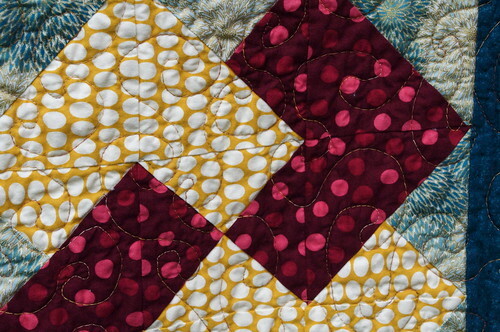 The paprika quilt is wayyyy to pretty to languish in the UFO pile. It should move to the top of the WIP pile, pronto! Also, the quilt formerly known as the lab quilt looks great. I think she'll really appreciate it. this new quilt is awesome! I remember falling in love with the blocks as you finished them. congratulations on another great finish and your heart is as big as Alaska! i have a lot of wip's! i also usually have 3-5 books going at one time so i can do whatever suits my mood. thanks for distinguishing between the two. i now have no ufo's in my house! wow - that's lovely, well done! I haven't tried a sampler yet, but you're making me want to. What a beautiful quilt! It looks like it would be right at home in a leafy park in fall. I really like your quilt. The colors are beautiful and the blocks being different sizes adds so much interest and fun! Great work. Thanks for the note about UFOs and WIP. I think that it is a wonderful idea to give this quilt to your recovering co-workers. I'm sure it will be greatly appreciated and really come in handy, too. These colors are so rich! I really like the yellow/white oval print. This makes me long for fall. We missed it last year since we moved to Moçambique at the end of summer. I love your sampler quilt! Just beautiful. My quilts are mostly WIPs. It's kind of like a dance and I pick a different partner every time I sit down at the machine. No guilt at all. 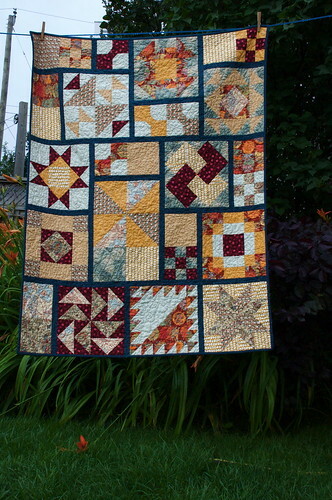 What a gorgeous sampler quilt! And so generous of you ... I know the recipient will love it! Thanks for explaining the difference tween UFOs and WIPs. I too had lumped them together, but it all now makes perfect sense. Oh I love those yellow polka dots. And what a sweet gift for your friend! Sending well wishes her way. I love the little projects. They keep me sane while my quilts usually take a year to make. Have a good trip! 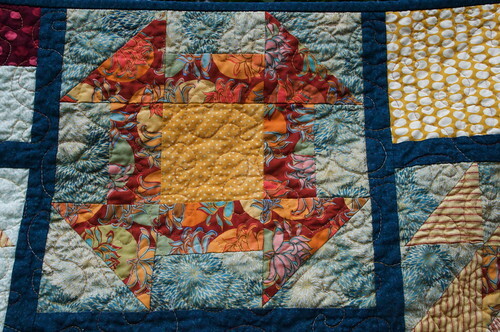 I really like how your sampler quilt turned out and I think the sashing between the blocks really defines each block. Thanks for the food for thought about the difference between UFO"s and WIP's. Not something I had thought aabout before. I really like the different sized blocks. And the WIP and UFO distinction makes sense. it's so lovely...i just like it. great job! and the photo is simply great. Now I want to make one too..
this turned out beautiful! I love the differnet sized blocks and the blue colored sshing.